The Dreambaby Nottingham 2-in1- Gro-Gate is an extendable wooden gate which can fit openings up to 41 inch (104cm) without needing to use any extensions! Extremely versatile, this gate can be used as either a pressure-mounted or hardware-mounted gate. To use as a hardware-mounted gate: opens in both directions with a convenient one-handed operation. Gro-Gate design ensures that it can fit a openings from 27.25 inch - 41 inch without the need for extensions. To use as a pressure-mounted gate: simply replace the hinges with additional screw caps. Pressure mounted barriers are a fantastic way to increase safety in the home without creating holes in the walls no screws, drills or tools required! Perfect for a rental or holiday property! Made of strong, high-quality materials to keep even the most eager pets restricted to a desired area, this stylish and modern looking gate provides flexible solutions for childproofing your home, while maintaining an elegant appearance! EXPANDS WITHOUT THE NEED FOR EXTENSIONS: Gro-Gate - Extendable wooden gate which inchgrows inch to fit openings from 27.25 inch to 41 inch without the need for extensions and measures 29 inch tall. 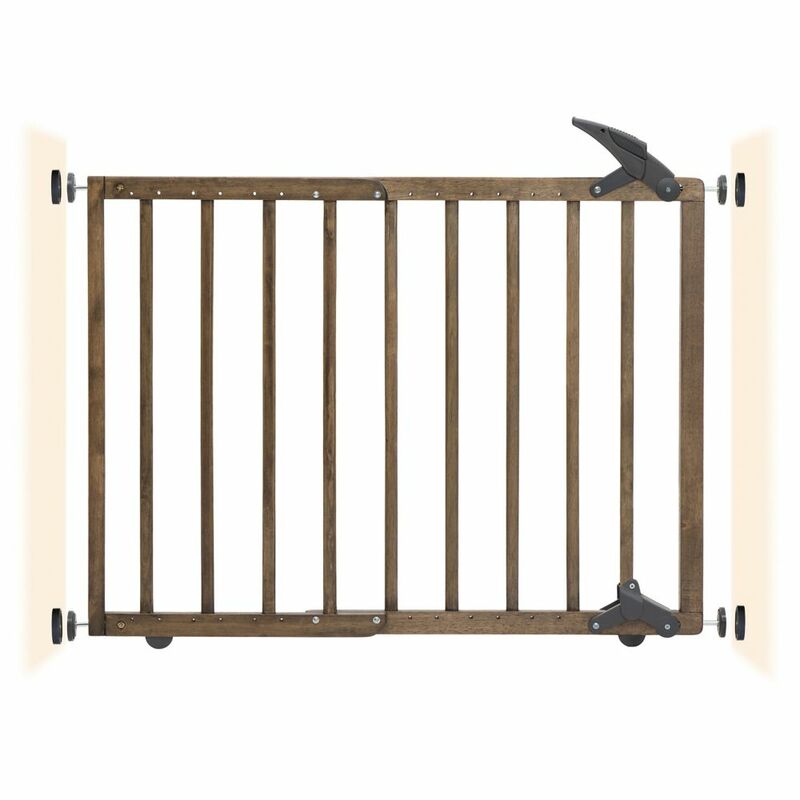 Nottingham 2-in-1 Gro-Gate - Driftwood The Dreambaby Nottingham 2-in1- Gro-Gate is an extendable wooden gate which can fit openings up to 41 inch (104cm) without needing to use any extensions! Extremely versatile, this gate can be used as either a pressure-mounted or hardware-mounted gate. To use as a hardware-mounted gate: opens in both directions with a convenient one-handed operation. Gro-Gate design ensures that it can fit a openings from 27.25 inch - 41 inch without the need for extensions. To use as a pressure-mounted gate: simply replace the hinges with additional screw caps. Pressure mounted barriers are a fantastic way to increase safety in the home without creating holes in the walls no screws, drills or tools required! Perfect for a rental or holiday property! Made of strong, high-quality materials to keep even the most eager pets restricted to a desired area, this stylish and modern looking gate provides flexible solutions for childproofing your home, while maintaining an elegant appearance! Nottingham 2-in-1 Gro-Gate - Driftwood is rated 4.0 out of 5 by 10.